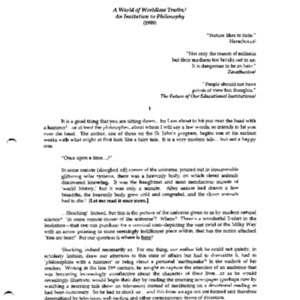 Typescript of the convocation address given by Chris Nelson for the Fall 2003 semester in Annapolis, MD. Entitled "Homer and the Power of Men That Have Chests." 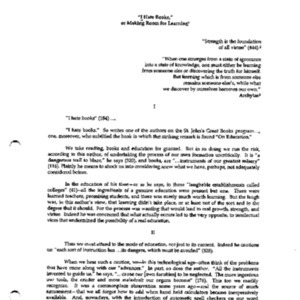 Typescript of the convocation address given by Chris Nelson for the Fall 2006 semester in Annapolis, MD. 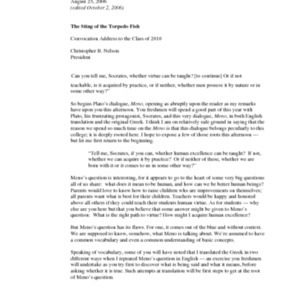 Entitled "The Sting of the Torpedo Fish." 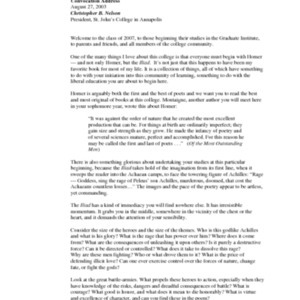 Typescript of the convocation address given by Chris Nelson for the Fall 2007 semester in Annapolis, MD. 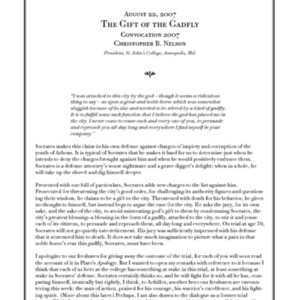 Entitled "The Gift of the Gadfly." 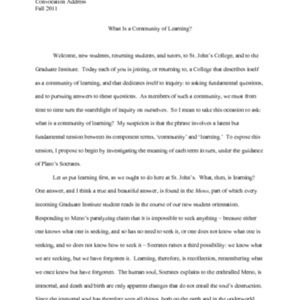 Typescript of the convocation address given by Chris Nelson for the Fall 2008 semester in Annapolis, MD. 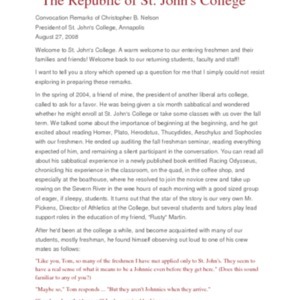 Entitled "The Republic of St. John's College." 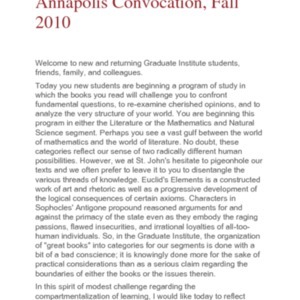 Typescript of the convocation address given by Chris Nelson for the Fall 2009 semester in Annapolis, MD. Entitled "The Things of Friends Are Common." 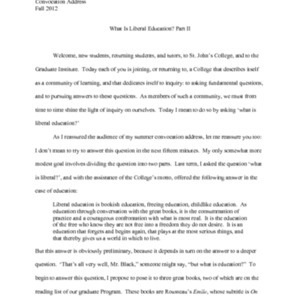 Typescript of the convocation address given by Chris Nelson for the Fall 2011 semester in Annapolis, MD. 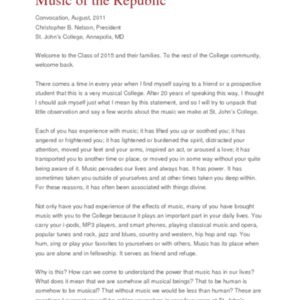 Entitled "Music and the Republic." 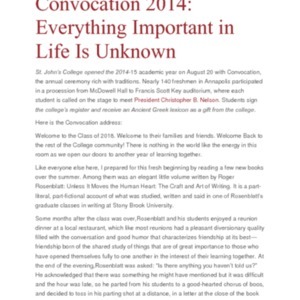 Typescript of the convocation address given by Chris Nelson for the Fall 2013 semester in Annapolis, MD. 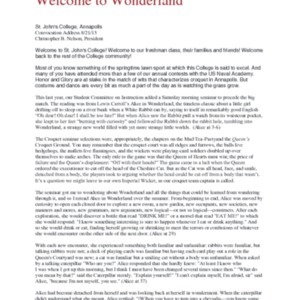 Entitled "Welcome to Wonderland." 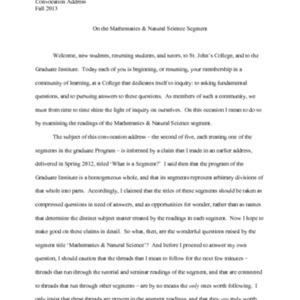 Typescript of the convocation address given by Chris Nelson for the Fall 2013 semester in Annapolis, MD. Entitled "Everything Important in Life Is Unknown." 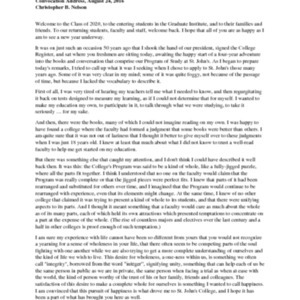 Typescript of the convocation address given by Chris Nelson for the Fall 2016 semester in Annapolis, MD. Entitled "The Pursuit of Happiness." 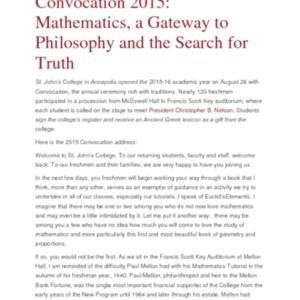 Audio recording of the convocation address given by Pano Kanelos for the Fall 2018 semester in Annapolis, MD.